To help you make effective use of tags in OmniFocus 3, I added a Tags for OmniFocus 3 page to Learn OmniFocus. Read on to learn more about the transition from contexts to tags and for more information on what’s in store. In OmniFocus 2 (and earlier) you can use a context to further define a project or action. A context is a Getting Things Done (GTD) term that refers to the condition that must be present in order to carry out an activity. Contexts make it possible to filter lengthy task lists and to reveal those actions and projects that are most relevant based on your current circumstances. For example, a context of “Home” would be added to actions that you need to be physically at home to accomplish, and “John” would be added to actions that require that John be present in some form. This generally works well, except that each OmniFocus item is limited to one context. Sometimes it makes sense to have multiple contexts. For example, if there’s an action that you can only accomplish at home when Mary is present, you’d be forced to decide between giving it a context of “Home” or a context of “Mary”, even though both are equally applicable. OmniFocus 3 removes this constraint. Contexts are now called “tags” and you can now add multiple tags to items. And tags can be used for more than just GTD contexts. In fact, they can be used to represent any attribute that helps tie related projects and actions together. To help you make effective use of tags, we recently launched a page dedicated to using OmniFocus 3 tags. This directory currently contains over 40 examples of tags grouped into nine categories, and we plan to add more examples soon. For now, you can only make use of multiple tags on iOS. The good news is that OmniFocus 3 is coming to the Mac in September (and sooner if you’re willing to help test) and will have full support for tags. In the meantime, you can still make limited use of tags on the Mac. All of the tags that you create on iOS will show up as contexts on the Mac. And the context field on the Mac will contain the first of the iOS tags. I encourage you to use these tags as a starting point and make them your own. Give them whatever name is most meaningful. If you want to add some visual flair, consider including an emoji in the name of your tags. If this is visually distracting, leave it off. OmniFocus 3 (Pro) also introduces support for Advanced Perspectives that, among other things, allow you to quickly and conveniently filter your OmniFocus database using tags. For example, you could have a perspective that lists everything you’d like to complete at home before going on vacation by creating a perspective that shows actions that are tagged with both “Home” and “Vacation”. 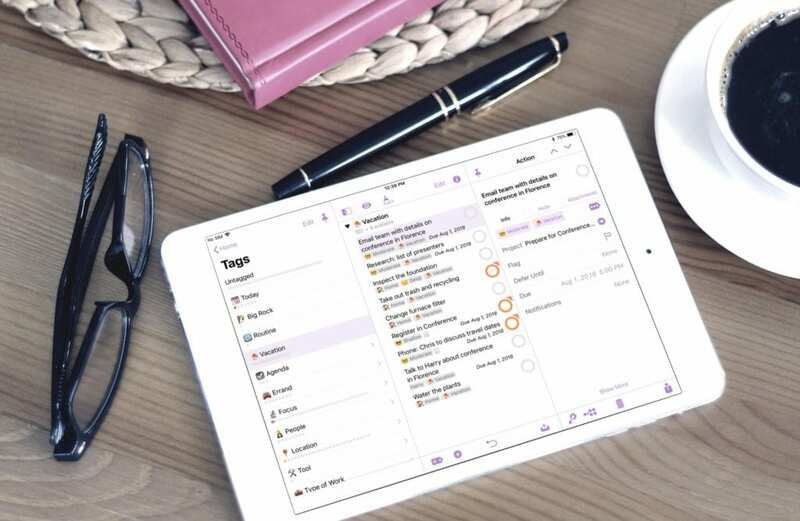 Visit our Custom Perspectives for OmniFocus 3 page to reference a growing list of use cases for OmniFocus 3 perspectives. Be sure to bookmark the OmniFocus 3 Tags page and check back soon for more examples.